This amazing, 5 year young, home has over 5, 300+ finished sq.ft. 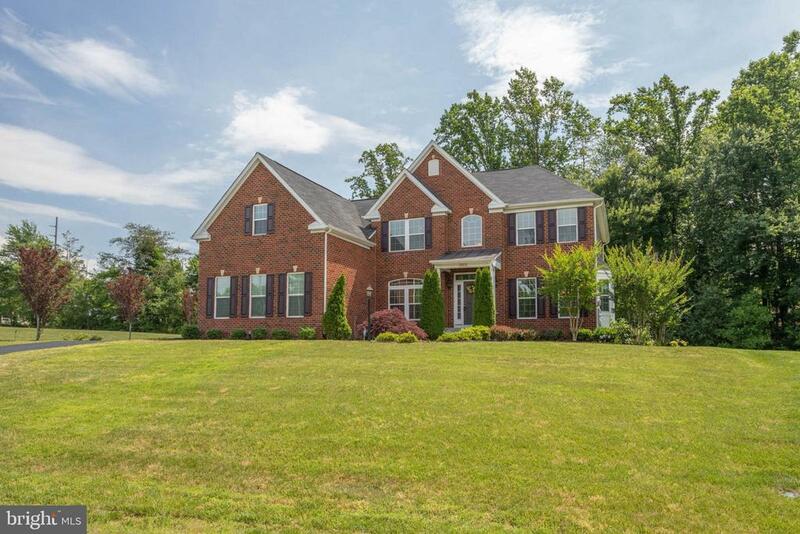 with 4 bedrooms, 3.5 baths, huge finished walkout basement and 3 car, side-load garage on 1+ acre lot backing to trees with NO HOA. A former Ryan Homes model, it has all the bells and whistles and fine details including: wide plank hardwood floors on the entire main level, crown molding, chair rails, installed, surround-sound speakers, security system, 14 zone irrigation system, and MORE!Enter this home and you are greeted by an impressive two-story foyer and beautiful staircase. The main level features a separate formal living and dining rooms with beautiful bow windows to let in an abundance of natural light and decorative columns and archway. The heart of the home is the gourmet kitchen and features a spacious layout with granite counter tops, abundant cabinet space with pull out drawers, stainless steel appliances, a double wall oven and upgrades which include an extra long island with breakfast bar seating and the light filled morning room.The open floor plan invites everyone to stay connected in the conversation from the kitchen and morning room into the inviting family room, where family and friends can gather comfortably and enjoy the floor to ceiling stone hearth gas fireplace. Additionally on the main level is a private office w/glass French doors off the front foyer and a spacious laundry room/mud room off the garage. Upstairs, this home continues to impress. Through the double-door entry is the master suite featuring a spacious bedroom, large sitting room, and a luxurious bathroom with separate shower and soaking tub, dual vanity and two large walk-in closets. There are three additional spacious bedrooms and one additional full bath w/dual bowl vanity on the upper level. The lower level features amazing finished space including a rec room, a theater/media room, full bath, possible guest room/gym, AND storage space! There are two VRE Commuter Lots within 7 miles of this home. Shopping centers in the area include: Potomac Mills Mall and Stonebridge Town Center both just 11 miles away. Potomac Mills is Virginia~s largest outlet mall and features an indoor shopping experience with over 200 stores, 25 eateries/restaurants, and an AMC 18 Theatre and IMAX experience. Stonebridge Town Center is a new community hub and is a fresh, lively gathering place for all to enjoy. There is an eclectic mix of retailers and restaurants as well as community events such as concerts, children~s entertainment, Saturday night movies on the Jumbotron, and the new Alamo Cinema Drafthouse. For outdoor enthusiasts, there are two parks nearby: Leesylvania State Park and Prince William National Forest. Camping, hiking, picnicking and bicycling can be enjoyed at both parks, and water activities (kayaking, fishing and boating) can be enjoyed at Leesylvania Park. The location is convenient to shopping, dining, parks, commuting and sought after schools, all of which makes this an ideal spot to call home.